Great Post! I was thinking as I went to the link, "I just put mine someplace and wait." Why do others think more trouble is worth the effort? 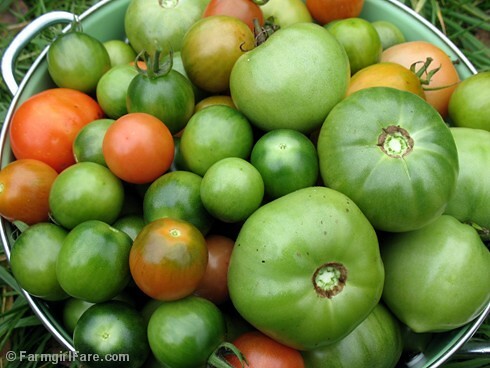 Thanks for your posting , good to hear about the exploits of others with their crops of geen tomatoes. I live in England , and our summer has been mixed to say the least. I grew about 10 vines in my garden , facing where they get the sun for as much of the day as possible. I had a great crop, they were all different varieties from cherry to ordinary , yellow and big beef ones. They all conveniently ripened in different stages keeping up with our eating needs. I only have a few left which are green now. But I planted some vines in my brother's garden a bit later than mine , and they have yielded a huge crop .. all of which are now really large.. but still green. What I am planning to do is put them in a couple of seperated layers in card boxes maybe with a banana in there for good luck. Hopefully they will ripen in stages also. Happy Growing to you. Ian , Essex, England. I may wind up making another 4 batches before Im done.. its the tastiest stuff. It reminds me so much of salsa verde.. Yummm! Great in & on anything & everything. Its the BEST! !